Scion is pulling the plug on the iQ in the U.S. after the Smart competitor racked up a measly 2,040 sales – down 50 percent from the previous year. Scion head Doug Murtha told Bloomberg that the iQ won't be "staying in the lineup much longer", but the rest of the Scion models will solider on. Murtha called it a "healthy experiment" that people never warmed up to. "Physics are physics," Murtha said. "And [customers are] nervous about driving a vehicle that size." That's one explanation, assuming you forget about the Smart ForTwo, which is shorter and narrower, managed to sell 10,453 units last year – five times more than the iQ. 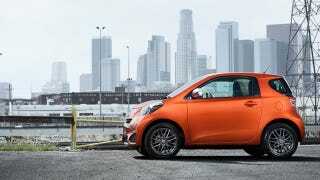 But the death of the iQ in the states points to a larger issue for Scion. Murtha says that for the brand to work it needs to sell at least 100,000 vehicles a year, and the last time it hit that mark was in 2008. To try to right that wrong, Scion will be bringing three new models to market in the next three years, two of which we already know are coming in 2015: the iM-derived hatch and some kind of sedan. That leaves two years for one more product to land. Posit your guesses, hopes, and dreams below.